I like to see old paintings, sketches and etchings, because they reveal the atmosphere of a particular period in time. Here is a lovely picture of an etching from the Victorian period, which spanned the years 1837 to 1901. 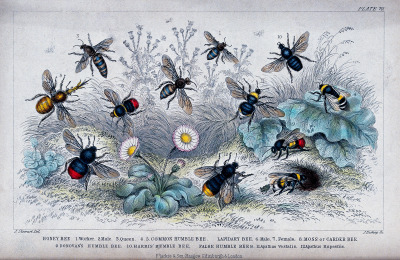 "Nine species of bees swarming a flowery meadow" - coloured etching by J. Bishop, 1855, after J. Stewart. Nine species of bees swarming a flowery meadow. Coloured etching by J. Bishop, 1855, after J. Stewart. It's interesting to compare the names of bee species in Victorian times, because names can evolve over time - I write about this in my page Should Bumble Bee Be Written As One Word Or Two? Species can also be re-categorized. On this etching, all of the bumble bees are referred to as 'humble bees'. COMMON HUMBLE BEE (of which there are 2 - the one digging into the soil, the other on a leaf above it). We tend to join the words 'moss' and 'carder' together, to form the name 'moss carder bee' (Bombus muscorum). However, with some of the images it's difficult to fully identify the species as recognisable today. For example, I had not heard of the species 'Donovan's Humble Bee'. I wonder whether it's because this species is long extinct. It looks fairly similar to Bombus pormorum - the Apple bumble bee, considered to be extinct in Britain. Similarly, I'm uncertain about the Harris' Humble Bee, though it looks fairly similar to the dark form of Bombus ruderatus - the large garden bumble bee, which can appear fully black. In traditional etching, a metal such as copper, zinc or steel plate is covered with a waxy drawing surface, which is acid-resistant. An artist then scratches off the waxy surface with a pointed etching needle to create an image by exposing the bare metal beneath. The metal plate is then dipped or washed in a bath of acid. The acid dissolves part of the exposed metal - in the form of the scratched image. Once the waxy layer is removed from the metal plate, the plate is then inked all over, and then the ink wiped off the surface, leaving only the ink in the etched lines. The metal plate is then put through a high-pressure printing press, together with paper. The paper picks up the ink from the etched (scratched) lines, to make a print. Encaustic art is a form of art using beeswax as a medium. You can read more about it here.